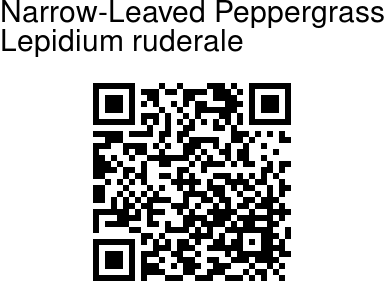 Narrow Leaved Peppergrass is an annual or biennial foul-smelling herb, 20-30 cm tall. It is single-stemmed, much branched above, hairless or sparsely covered with short spreading hairs. Basal leaves are double- or triple-compound, long-stalked, forming a loose rosette or withering early. Stem leaves are pinnate with narrow entire segments, upper segments narrow, oblong, stalkless. Fruiting stalks are slender, ascending, 2-4 mm. Fruits are ovate or broadly elliptical, narrowly winged above, 2-2.5 x 1.5-2 mm. 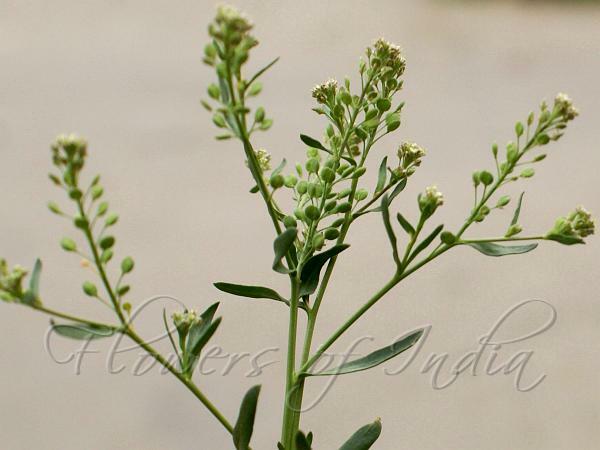 Narrow Leaved Peppergrass is native to Europe and West Asia, naturalized in many places, including India. It is found on roadsides, waste places, from sea level to 1500 m.